Strain sensing during operation allows for continuous monitoring of changes in potentially hostile areas, which leads to mitigation of integrity risks and reduction of maintenance costs. Of the various different types of strain sensing systems described, Micron Optics’ quasi-distributed approach based on monitoring FBGs was highlighted for its simple cabling architecture (ability to 10’s of gauges on 1 channel) and its moisture resistance. 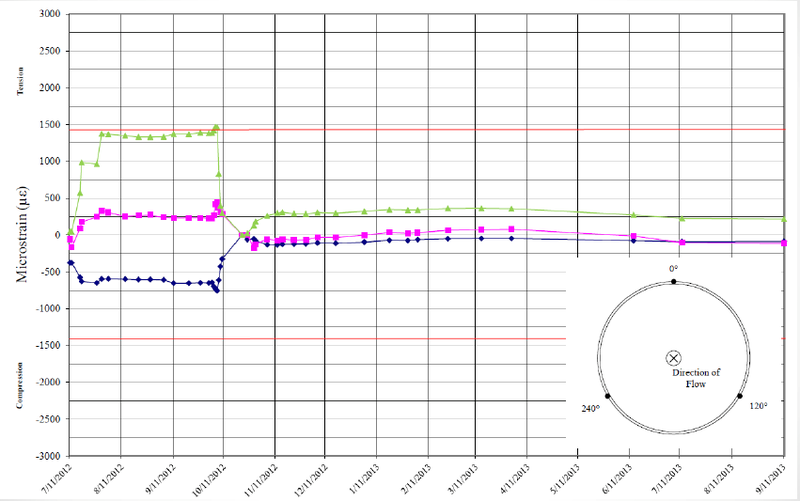 The figure below shows an example of field data taken using a combination of a Micron Optics si225 interrogator as well as Micron Optics os3110 spot-weld strain gauges. These strain data clearly show the onset of side-bend over stress.